Wednesday May 16th 1894 I was busy with the house work most of the day. It is very warm weather. Will began planting the sod ground in corn today. I washed a lot of windows. My turkeys are hatching very well. Thursday May 17th 1894 I went to town early this morning and over home for strawberry plants. I got seed corn for Will. It looked like rain. I hurried home and forgot the meat I was to get. After dinner I went back to tone and Saukie followed me. I left her at Mains while I went up town and could not find her when I went back. I looked all over town and went over the river. After supper Will sent Leonard down and he brought her back she had gone in the cellar. 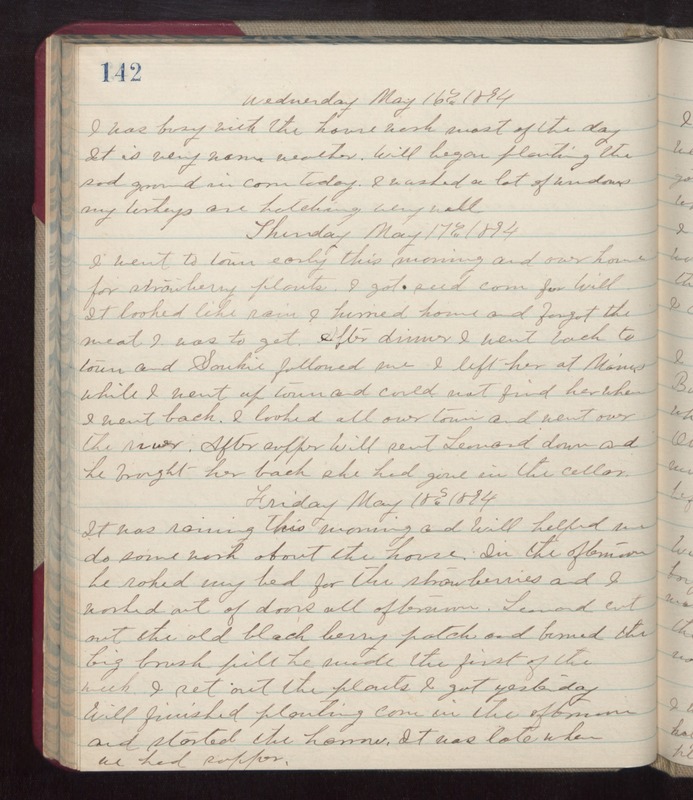 Friday May 18th 1894 It was raining this morning and Will helped me do some work about the house. In the afternoon he raked my bed for the strawberries and I worked out of doors all afternoon. Leonard cut out the old black berry patch and burned the big brush pile her made the first of the week. I set out the plants I got yesterday. Will finished planting corn in the afternoon and started the harrow. It was late when we had supper.